The path to truth begins with humility. Don’t let the classical reference fool you — I am in no way well-versed in Greek philosophy, and my interpretation of the phrase probably deviates from scholarly interpretations. However, the quote conveyed to me a humility in knowledge, of being aware that what you know is neither exhaustive nor authoritative. The concept resonated strongly with me, especially as a first-generation American who grew up navigating multiple worlds — which in a way everyone does, regardless of background. Home life and outside life were distinct, and observation showed me how to behave in both. Even within each sphere, there are nuances. My family comes from a region in China that has its own dialect, completely distinct from Mandarin. I grew up learning both English and Chinese before coming home to hear my parents and grandparents speak to each other in an entirely different third language. Make no mistake, I’m only fluent in English — and by some academic paper-writing standards, just barely. I was born and raised in Austin, Texas, an incredibly vibrant city that helped me understand that it was okay for people to be different. Keep Austin Weird. My best friend when I was three years old was a kid whose parents dressed him in cowboy boots and blue jeans every day of preschool. There’s also a photo out there somewhere of my toddler self, my dad and Leslie Cochran, a cross-dressing homeless man who ran for mayor of Austin three times. Both of these environments proved to me that my knowledge was uncomprehensive, and that was okay. Being Chinese wasn’t the same experience for everyone; living in Texas wasn’t the same experience for everyone. In this way, knowing nothing helped me learn more. Learning, then, is a continual process, so it makes sense to try to be unpretentious about what you currently know. By extension, everyone else is probably learning as well, so it couldn’t hurt to be compassionate about what they know. These guiding principles have held whether in playing sports, learning in the classroom, navigating college or joining The Dartmouth. 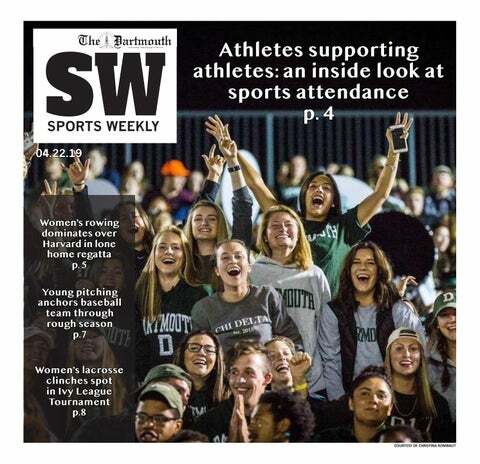 I ventured into entirely new territory writing for The Dartmouth freshman fall, starting in the sports section out of interest after retiring my high school football cleats. I never wrote for a high school publication and didn’t consider myself a writer by any means. Through the lens of sports, I fell in love with people’s stories, each one reminding myself of the individuality in people’s experiences. My approach at The Dartmouth was familiar — all I knew was that I knew nothing. There was a lot for me to learn — everything from conducting interviews and writing ledes to telling stories and conveying truth. My background, or lack thereof, made me a cautious college journalist; mentors, editors and peers helped me become a competent one. Time and again, editing at The Dartmouth reminded me of the limits to what I know. At the newspaper, we were always learning about one new topic or another, challenging the extent of each other’s knowledge in the pursuit of delivering comprehensive truth. This held especially true in understanding that every person has their own unique life experiences. Knowing the entirety of someone else’s life story is near impossible, but acknowledging the validity of each other’s stories is another step in the journey from not knowing anything. In a similar vein, disagreeing with others on certain hot-button issues shouldn’t be limiting, but rather illuminating — both in terms of what you may not know and what you may not have previously considered when trying to understand another person’s perspective. Similarly, Dartmouth may be good to some people and not as good to others, and both experiences are worth learning about. With people’s experiences at the core, we can hopefully achieve a better understanding of the world around us. This is more or less a long-winded way of saying what many other Dartmouth students will say — that there isn’t just one singular Dartmouth experience. I think, by extension, many people will also tell you that there isn’t just one singular life experience. With that in mind, as I continue to ask people for advice about the looming “real world,” I’ll start where I have several times before — by knowing nothing. Ray Lu ’18 is the former editor-in-chief of The Dartmouth.